WEST COVINA, Calif. -- A bat-wielding man was taken into custody Monday morning after he threatened civilians and bystanders at the West Covina Police Department and was tackled by an officer, officials said. Christopher Rivas, 28, was arrested for alleged assault with a deadly weapon and resisting an officer, a news release said. 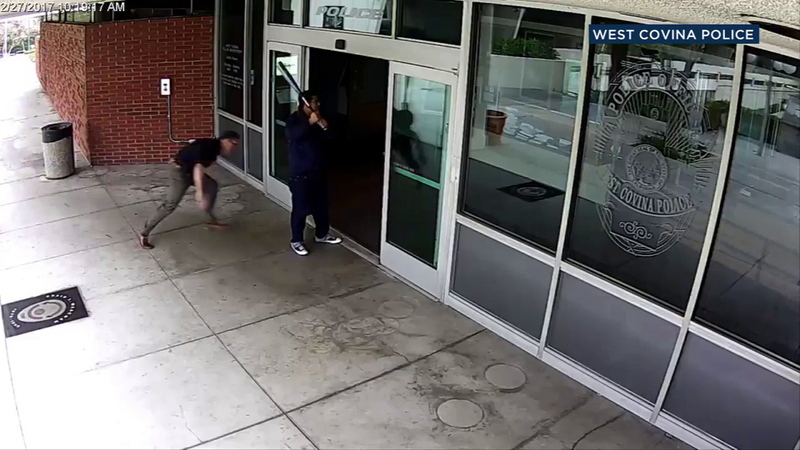 The incident, which was captured on surveillance video, began about 10:18 a.m. when Rivas approached the department's front lobby on foot and "began striking the large glass windows," according to the statement. Three civilian women rose from their seats inside the lobby and ran to a secured area. "As officers responded from within the police station, the suspect walked up to the entryway repeatedly swinging and striking the glass entry doors, threatening to enter," authorities said. An officer was outside and saw what was transpiring. The footage shows him running toward Rivas from behind and tackling him through the entrance. Several other officers then help the officer subdue and handcuff the suspect. Rivas, who suffered minor injuries, was transported to a hospital for treatment. He was cited and released to the custody of the Los Angeles County Medical Center, police said. No one else was hurt, and the building's windows were not broken.